What a beautiful workshop/log cabin for your garden! This stylish building decorated in a pretty blue colour will make spending a time on your gardening projects or relaxing inside an enjoyable experience. 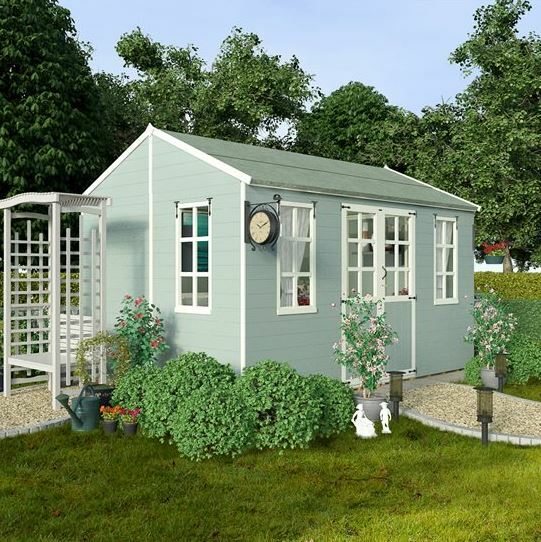 With a 12x8ft interior there is plenty of space to spend hours with your favourite hobby or gardening projects. Looking for a log cabin workshop? Who needs a house when you’ve got this beauty in your garden? 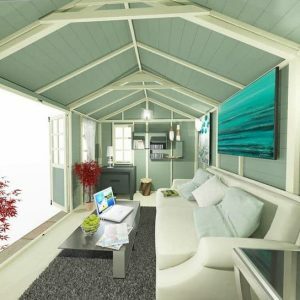 Utterly gorgeous – this is the premier league of workshops or summerhouses. With an enormous abundance of interior space, room for you to enjoy your favourite hobby and for you to potter around not to mention relax this is truly an astounding building. The windows are large and fully functional, allowing plenty of light and air to flow inside, the doors are big enough to ensure ease of transport when moving equipment inside and out. It comes complete with a stylish garden clock and window boxes – you won’t want to leave it! No doubt, visitors to your garden will be impressed with this stylish outhouse – an absolute must! This workshop/log cabin definitely wins all the awards in the style category; it is simply the most stylish and prettiest workshop we have seen. 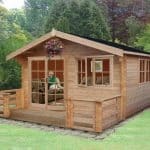 If you want a garden building that offers practicality without compromising anything on style then this could be the workshop/log cabin that you have been looking for. The Billyoh 5000 Eden premium workshop/log cabin could be the cost effective solution that you have been looking for your new workspace. 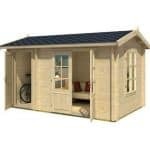 Combining premium quality and design, the Billyoh log cabin workshop is surprisingly affordable especially for the 12x8ft interior. 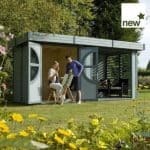 Below the team at whatshed.co.uk take a look at this models many features and charming design touches that make it stand out from your average garden workshop. Exterior: A strong framework with tongue and groove boards that give the exterior extra durability and superb weather protection for your items all year round. 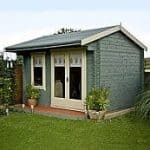 With extra-thick framing, this building is a cut above the rest with a heavy duty feel that is built to last for many years within your garden. 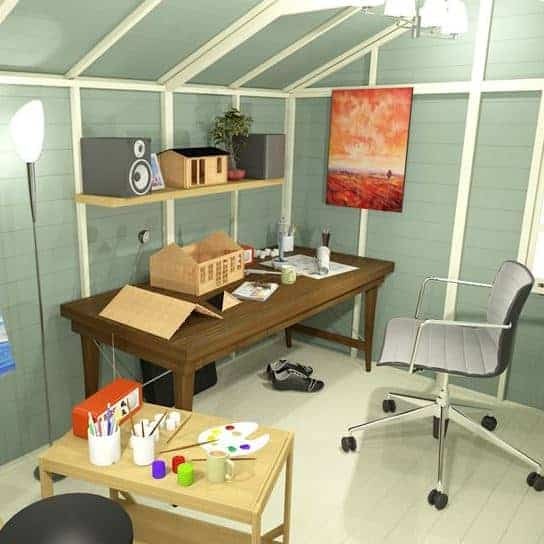 Interior: The superb 12x8ft interior provides a fantastic workspace that holds endless possibilities in regards to how you can use it and the layout that you wish to adopt. Whatever you wish to fill the interior with, from workshop tables to storage solutions, this fantastic building will easily hold it all. Windows & Doors: With windows on multiple sides and two separate sets of large double doors, this is exceptionally well-designed for its purpose as a workshop. All the windows are fully functional and the two sets of doors provide a walk through that is great for a busy workspace and easy access to take items in and out to the garden. Security: With no security fittings present on the existing model, we feel that it would be an easy enough job to add a padlock or similar security device to both the sets of double doors. Security fittings may be purchased separately for a modest price. 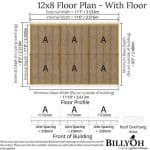 The Billyoh 5000 Eden Premium Workshop/Log Cabin: How easy to build? Billyoh have purposefully made all of their parts smaller and easier to handle than ever before. 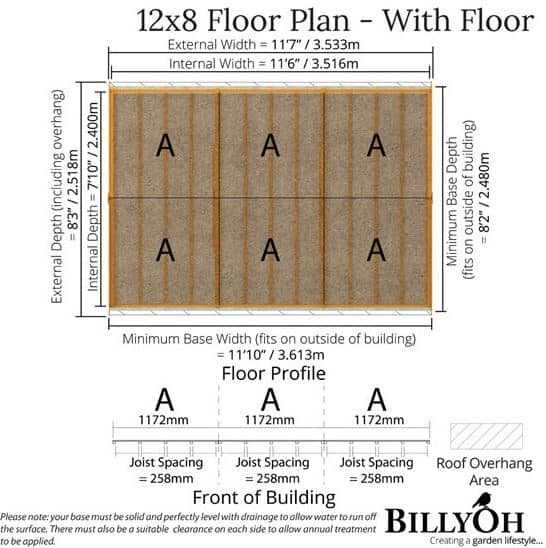 However, despite the possibility of an individual assembling this workshop/log cabin by themselves, Billyoh recommend that a team of two work together to assemble this model due to the size of the building itself and for the sake of time. Full instructions will be provided in your package along with all the parts, glazing, roof material, fixtures and fittings required for assembly. Following the step by step detailed instructions we expect that you will be able to have your new workshop built and ready to use within a day. 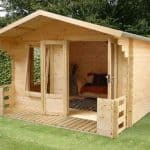 The Billyoh 5000 Eden Premium Workshop/Log Cabin: What is the overall quality like? Billyoh have done it again, proving that premium style and quality can coexist within the same garden building without compromising on either. 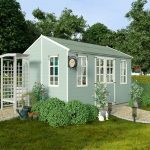 A British company with a knack for well-designed garden buildings that suit their users’ needs and lifestyles. The super stylish and practical tongue and groove cladding offers excellent protection for items inside, even in the harshest weather conditions. The many windows and doors offer a huge amount of light and fresh air to enter the workshop interior, making a fresh and comfortable environment in which to work. With two flooring options – either a single solid sheet flooring for light activities or occasional use or premium tongue and groove flooring for those using their workshop for more heavy duty activities. Wow – who would believe that this beautiful building is a workshop/log cabin? 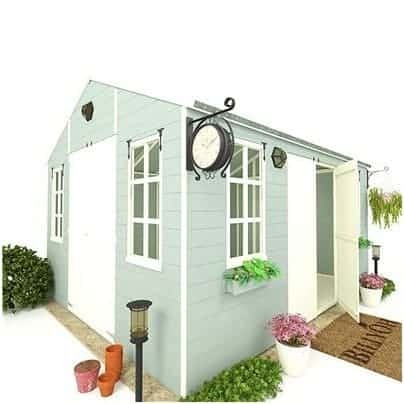 This exquisitely painted garden building will certainly become the main feature within your garden the moment it is assembled. 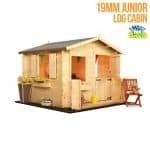 Standing at 12x8ft, your workshop/log cabin will be a spacious haven in which you can potter around with your latest projects, gardening or otherwise. At this higher end price point, this incredibly attractive building is certainly one of the prettiest we’ve seen, particularly in the workshop/log cabin categories. This was a home that was places as a guest house on a rather large plot of land. We thought it was the perfect look for the English shore. We love Brighton and moved here after retirement because we came here so many weekends. We downsized the house to a bungalow with land attached and thought this made the best guest house for family visiting. It sleeps two comfortably and is easily converted to any amenity. This depends on what you want to spend and what you use it for. But just “as is” is still very good value for money.